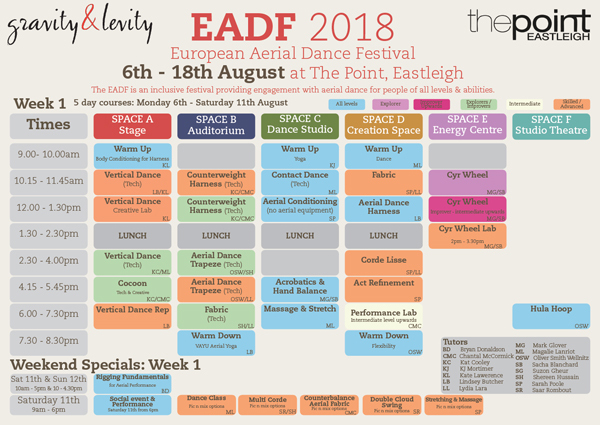 9th annual European Aerial Dance Festival 2018 website is LIVE! 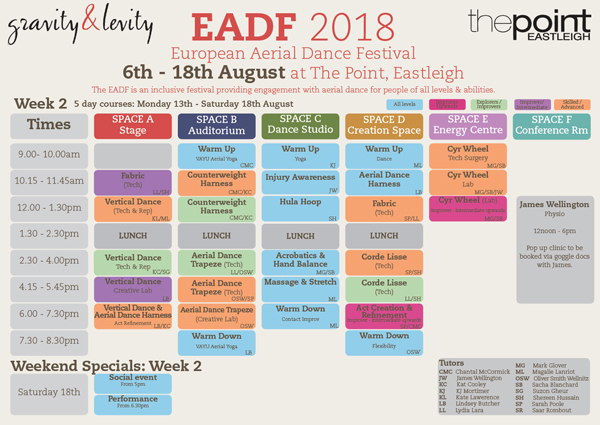 You can find all the fabulous courses and classes of European Aerial Dance Festival 2018 on the EADF website - start planning your fortnight of flying now! EADF is now in its ninth year and we are thrilled to welcome participants from around the globe at all levels of their practice. #EADFest 2018 will run again as a 2-week festival but you can also choose to come just for 1 week, the weekend or Saturday only pick n’ mix cornucopia of delights. We’ll be offering a weekend long ‘Rigging Fundamentals’ workshop with rigging supremo Bryan Donaldson - truly a must for anyone wanting to take aerial seriously - and a pop-up physio clinic with additional aerial and cyr surgery workshops in week 2 with James Wellington from Perform Health. 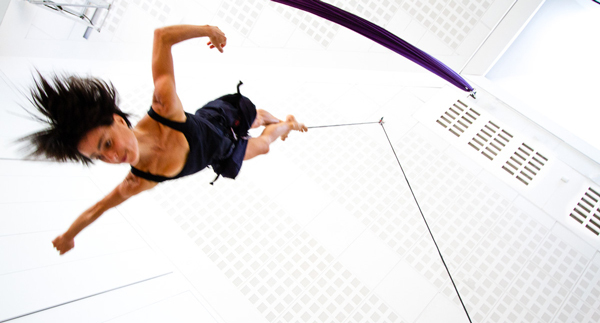 We’ll be joined by the wonderful Sarah Poole, one of the lead aerial coaches from Ecole National du Cirque in Montreal – if you didn’t get to train with her last year make sure you book in early for this – a truly exceptional aerial coach. As always we have an incredible team of tutors lined up for you with 2 (yes 2) tutors to every technique class giving you even more bang for your bucks. Bookings are open from Tuesday 14th March, so set an alarm and have your courses chosen ready! Copyright Â© 2018 Gravity & Levity, All rights reserved. "Vertical dance is a shifting practice of space plains: space practice where performer can negotiate new borders and limits in vertical and aerial territories using a multiplicity of knowledges, sensibility and skills." "La danza verticale è una pratica di spostamento dei piani spaziali. Anzi, è una pratica spaziale in cui il corpo del danzatore si occupa di negoziare frontiere e confini in territori verticali e aerei con una molteplicità di sensibilità, conoscenze e competenze." ilposto2010. Picture Window theme. Powered by Blogger.